Impress your guests and save time. 1. Click your chosen design. An order form will open. Simply fill in your names and wedding date. You can make changes to our standard wording if you wish. Click the green button to go to Check Out. The Check Out page will open. On the Check Out page, choose quantity required from drop down menu, click Add to Cart and pay. 3. EMAIL DRAFT When you have paid, we will send you an email draft for you to approve. This will have your details in place on the design you have ordered. 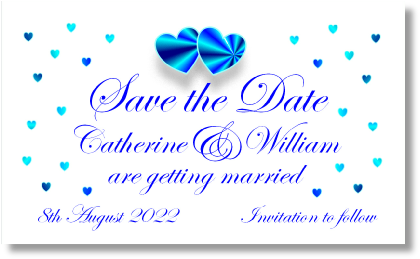 When you approve your e-draft and you are happy with your personalised save the date design we will print your order. You can easily personalise any design in a few minutes. Click any image to open the order form. Simply send us your names and your wedding date. Add any changes to text (eg add surnames or change to save the evening).